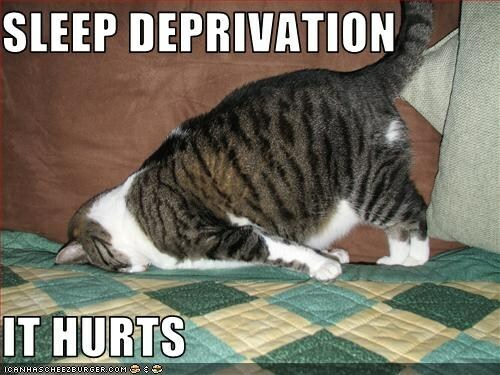 If I had one superpower, I would want to be a person who didn’t physically require sleep. Never mind being able to read minds or fly; I would be content with having oodles of free time without ever feeling tired. However, I realize that this magical transformation is not going to happen anytime soon, so in the meantime, I am left with sleeping for eight hours each night, like a regular mortal. Of all the things that have helped me improve my writing, the realization that sleep is important has helped me the most. When you’re running on four hours of sleep and coming back from an eight hour day at work, you will not feel like writing. And if you do write, you’ll be making mistakes of every kind– and you’ll be going veryyyyy slooooowly. You won’t be focused on writing; you’ll be focused on getting more sleep. And you’ll be failing at both. In a 2000 study by the British Journal of Occupational and Environmental Medicine, research showed that “people who drive after being awake for 17 to 19 hours performed worse than those with a blood alcohol level of .05 percent.” The results of this study demonstrate what most people already know to be true: sleep deprivation impairs your focus, which you need if you want to write. If you want to get serious about writing, then, you have to get serious about sleeping first. 1. Go to bed and wake up at the same time every day– even on days off. It sounds monotonous, but it makes you feel more well-rested all the time. Getting up at 5am on a day off can feel a little ridiculous sometimes, but think of all the writing you can get done! 2. Be a morning person. A small study from Current Biology suggests that everyone has the capacity to be a morning person if they limit their unnatural light and maximize their natural light. Waking up early gives you a lot of time to write before things start getting hectic. And if you do become a morning person, you’ll be in great company– many amazing authors are morning people, too. 3. Make your room as dark as possible when you’re sleeping. Extra light comes from all kinds of things– your clock, the streetlights, night lights– and it makes it harder to get a good night’s sleep. If you really can’t control the light around you, invest in a sleeping mask. 5. Choose sleep. Sometimes, life gets crazy, and you have to make tough either/or decisions. If I ever have to decide between sleep and something else, though, I always choose sleep. If I am choosing whether to write a six-page story and get two hours of sleep or get six hours of sleep and write two pages, for example, I’d go for the latter. (Then, I would make sure to finish the story the next day!) Approaching sleep with the same discipline as writing makes me more focused and it gives me time to mull over my ideas and think about my stories. Almost none of these rules work for me. I am nocturnal. Period. I sleep better when it’s light out. I sleep odd hours and take catnaps. For me as a writer, the interesting part of sleep is dreams. I have been in several dream groups, one when I was in high school, and another more recently. I have a dream journal going back to when I was 16. I think my experience doing dream interpretation has added dimensions to my writing. Oddly enough, one of my favorite filmmakers who explores the edges between dreams and reality, Terry Gilliam, does not himself do dream work. That’s so cool! I will definitely check them out. Dreams can be so inspiring. That is so awesome that you keep a dream journal– what an amazing record. Haha, some people are definitely night owls. A lot of great writers are, too, like Michael Chabon for instance. But it’s great to figure out what works for you. Just goes to show how everyone’s different! Fun article on people’s sleep habits. There was a piece this past year in one of the local newspapers arguing that the natural sleep cycle is bi-phasic, meaning that it’s better to sleep twice a day than only once. I’m inclined to agree. Another trippy sleep habit is that of dolphins and other marine mammals. They sleep with half of their brain at a time, while the other half stays awake to surface for oxygen and so on. This principle can be applied at work, where one half of the brain can remain conscious in order to ward off predatory managers with buzzwords, while the other half gets something useful done by dozing off. I remember reading a psychology study once that said humans have a similar thing– part of their brain remains alert during sleep. One of the examples they gave was that mothers who slept in the same bed as their babies never rolled over and squashed their babies, suggesting that they still were spatially aware, even though they were asleep; another example was that most people don’t roll off their beds at night– they remember where the mattress ends. Interesting to think about. What works for me? Beautiful bedlinen and an audiobook to take me to sleep.